This was our first rental from Premier and I want to say thanks for the good experience. You were accommodating, flexible and very easy to work with. I’d have no reservation about recommending you to other potential customers. 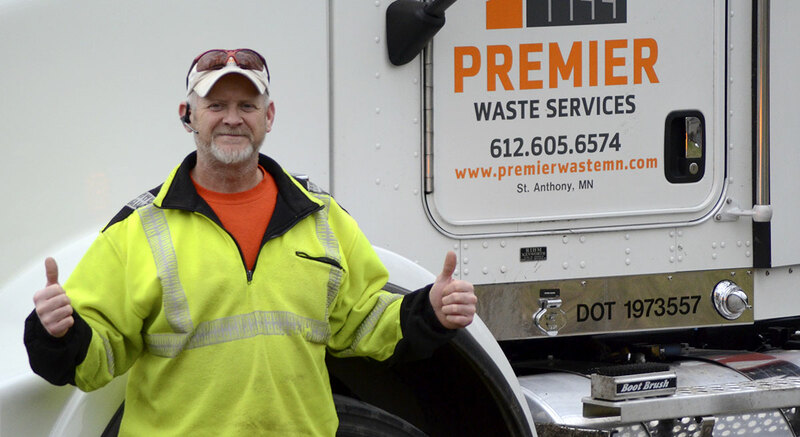 I Can't say enough about the service we received from Chris at Premier waste in Minnesota. We called another local company. They promised next day service, took and ran our credit card and not only didn't deliver for two days they also didn't return our calls! In a panic I found Chris not only on a Sunday morning but he answered on the first call and had a dumpster to us within the hour! We were in a time crunch since the house closing was the next day! Chris promised and delivered! When it's important for you to get service call Chris and don't mess around with shopping around! Learn from our mistake and call Chris at premier! I just wanted to let you know that I just put a review on Angie's List for your company. I'm not sure how to give a rave review for a dumpster, but I felt it necessary to say something positive. This transaction couldn't have been any more painless – you delivered on time, picked up on time, the price was right, and it was one less headache that I had to deal with for this roofing job. Thank you!!! Thank you Chris and Premier Waste Services!! At the VERY last minute, we decided we had enough garbage for a dumpster. We had never gotten a dumpster on our own, so we had no idea about pricing or whom to choose. After several calls to other places, I talked to Chris. There was just something about him that I liked – and I was right!! 2 hours later, Chris showed up with a 20 yard dumpster – all of his 10 yard dumpsters were already out. Being an incredibly personable and smart businessman, he quoted us a price lower than his competition AND said if we only filled it halfway, he would just charge us for the 10 yard. Chris was very flexible on the timing, too. We basically got to decide how long we wanted it, and there was no extra cost for us keeping it an entire week! The price was exactly as he had quoted – no surprises there – and we were able to fill the dumpster with completely random items; construction debris, furniture, a huge dog kennel, old plastic toys, etc. Of course, in the end we filled the entire thing!!! VERY trustworthy, good with children, excellent customer service. I would recommend Premier to ANYONE who needs a dumpster and has no idea where to go.